Maybe we should have seen it coming after the winter we had but this summer has been a series of hot, humid, hazy days with temperatures well in the 90s. Days like these call for as little cooking as possible; tall, cold drinks; and frozen treats. Several years ago my cousin convinced me to buy an ice cream maker. Generally I'm against purchasing an appliance that has a single use. My kitchen isn't large and storage is always at a premium. The first few years that I owned the ice cream maker had me regretting my impulse buy. Not sure what it is this year. Maybe I just saw a number or articles or recipes or maybe the heat got me thinking of cool treats or maybe the timing is just right. Whatever it is I've been making good use of my ice cream maker. I've favored making frozen yogurts for a few reasons. 1) Call it impatience but I don't like cooking, straining, then cooling the custard, 2) I love ice cream but I don't want to know how much heavy cream, whole milk, and eggs are used, and 3) I love tart frozen yogurt like Pinkberry. Not too many pictures to share this time. When the yogurt first comes out of the ice cream maker it's a little like soft-serve ice cream. And because home machines don't get as much air into the mixture and the recipes don't include stabilizers, the frozen yogurt freezes hard. So getting picture-perfect scoops has been tricky. The great thing about frozen yogurt is you buy the yogurt already made. I have made my own yogurt before but have never been successful in getting the same level of tartness or the right consistency. I favor FAGE Greek yogurt. 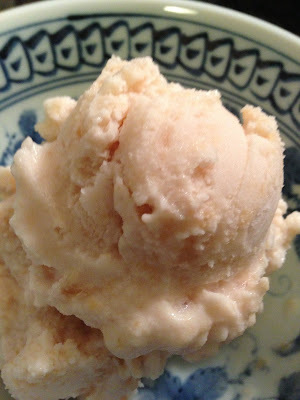 Two recipes I tried first I found on Epicurious - Tangy Frozen Greek Yogurt and Lemon Ginger Frozen Yogurt. 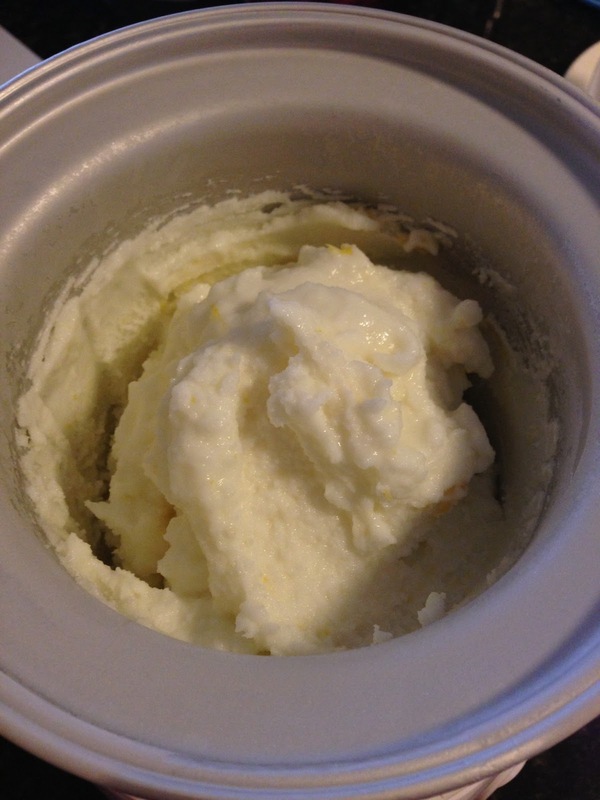 The second recipe calls for regular yogurt but I substituted Greek yogurt instead. They barely spent any time in my freezer I loved them so much. Next I tried to branch out and made Chocolate Frozen Yogurt with Caramelized Bananas. It's not my favorite attempt. I'm not sure if I used too much banana (the recipe calls for 2 large ripe bananas) or I caramelized them too long. I want to try it again because the recipe intrigued me but I still have some sitting in my freezer which tells you how little I care for it. After going through my magazines and recipes that I'd saved over the years I started researching books. It really doesn't take much to convince me to buy new cookbooks, I just need the shadow of a reason and I'm all over it. After reading reviews I settled on two books. The first is a classic, Ben & Jerry's Homemade Ice Cream & Dessert Book. Tons of positive reviews and like I said, a classic. The second book is David Lebovitz's The Perfect Scoop. I already like his blog and I liked some of the more unusual recipes in his book like black pepper ice cream, basil ice cream, and goat cheese ice cream with walnuts & honey. I've already made two batches of David Lebovitz's Peach Frozen Yogurt. So good, so refreshing, and it tastes of summer. The last frozen yogurt I made was just last night. I found Oreo cookies with mint filling and immediately wanted to make a frozen yogurt with them. 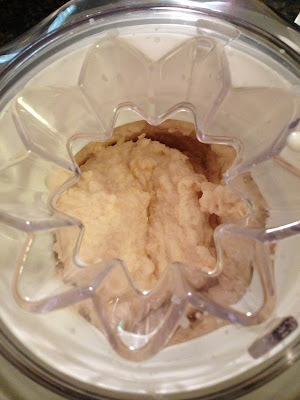 A quick search on the web brought me to this recipe for Cookies & Cream Frozen Yogurt. With such great pictures how could I not want to make this yogurt. I will say that the one thing I might do differently is use regular yogurt that I strain myself instead of Greek yogurt, something a little less tart. I'm finding the tartness competing too much with the Oreos and I'm not sure I like it. But again, I want to make it again and play around with it a little more. So that's my first installment of Hot Days, Cool Treats. I've been experimenting with other things like ice pops, sorbets, and vegan ice cream - yup, vegan. We're still only in mid-July and I have a feeling there will be a lot more warm or hot days to inspire me to test out more cool treats.